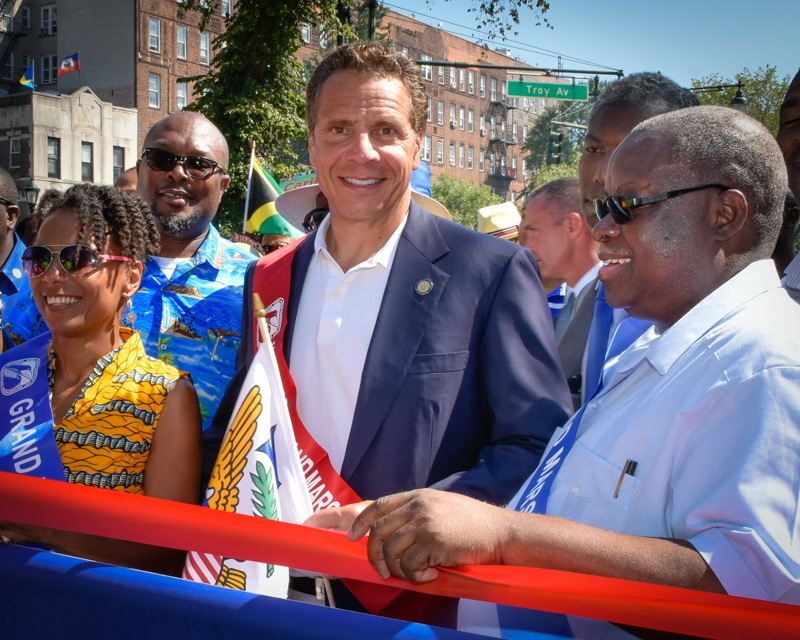 NEW YORK – On a warm, cloudless Labor Day morning, the fast beats of soca blended with the NYPD band playing a steel drum version of Bob Marley’s “One Love” as floats inched down Eastern Parkway in Crown Heights for the start of the annual West Indian American Carnival parade. Many revelers wore the flags of their respective nations draped as colorful, patriotic capes around their shoulders. Others “playing mas,” or masquerade, wore bright, neon feathers in their headdresses and at their elbows and knees. Men and women wore skin-baring costumes that included jewel-encrusted bras or heavily sequined silk shorts. Dianne Hunt-Roman stood outside the apartment building where she said she’s lived the past 29 years since moving from Granada. Hunt-Roman, 40, a child care worker, said she’s come to the parade every year she’s lived here. Wearing the red, yellow and green of her native Granada, she said the parade was about the Caribbean community coming together. Indeed, flags from any number of Caribbean countries — Jamaica, Barbados, Haiti, the Virgin Islands — were being waved along the parade route or had been transformed into clothing. It wasn’t just the outfits and the infectious Caribbean beats that caught the senses today. The smokey aroma of grilled chicken wafted above vendors every 100 feet or so near the parade route, covering the area in a barbecue-scented haze. Gov. 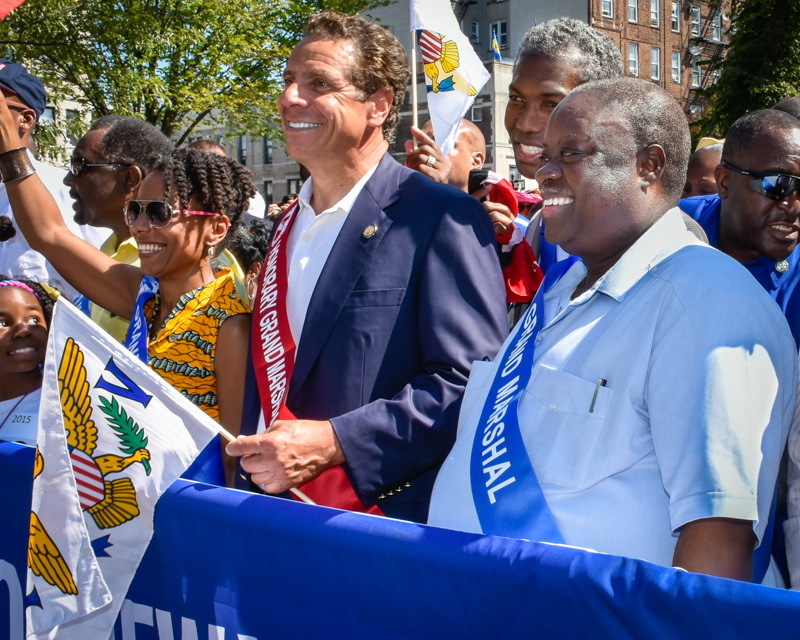 Kenneth Mapp (I-VI) who served as a grand marshal, noted that he was born in Brooklyn and that New York City has the largest population of Virgin Islanders outside the Caribbean. Caribbeans value education, she said. She and her husband Mayor Bill de Blasio urged attendees to sign up their 4-year-olds for the city’s free universal pre-K program. State Assemb. Michaëlle C. Solages (D-Elmont), a native of Haiti, also attended. Donald Williams, 56, of Kingston, Jamaica, said he has traveled from the Caribbean to Brooklyn for at least the past decade to celebrate his culture during the parade. He plays trumpet in the 35-member Inner City Marching Band. The group wore shirts in the green, black and yellow of Jamaica’s flag. Its youngest member was a 9-year-old boy who plays the cymbals. “It’s a Caribbean thing. It’s part of our culture. We represent,” Williams said of the carnival tradition. Donna Dove had one goal when it came to creating ornate costumes for the parade: Do it better than last year. The parade began at 11 a.m. with Mapp and grand marshals Maxine Williams, Facebook’s global head of diversity and Earl Phillips, secretary-treasurer of Transport Workers Union, Local 100. It started on Eastern Parkway at Schenectady Avenue and was to end at Grand Army Plaza. “Playing mas,” or masquerade, is a linchpin of the euphoric celebration of Caribbean culture that took over Eastern Parkway in Crown Heights as it does every Labor Day. The march is in its 48th year and was expected to draw as many as 2 million people. While it stepped off at 11 a.m., some events began earlier, such as the unofficial J’ouvert parties at daybreak. The skin-baring, brilliantly colored costumes often include tall feathered headdresses, sequined shorts and wings, or other accessories. Shana Francis, 27, of the Bronx, and her friend, Laverne Shaw, 24, were riding to the parade aboard the 4 Train about 30 minutes before the start. After dancing on the streets of Brooklyn into the early morning, Francis rushed back to her home in the Morrisania section to change into a purple and blue bikini with tall matching feathers. “Yes, you can take our picture,” Shaw said as they sat on the train with another friend, Jannel Daley, 27, of Baychester. Too excited to be tired, the feathered trio said this was their first time marching and dancing in the parade. The three got off at Franklin Avenue to meet their group as subway riders snapped photos. Dove, raised in Trinidad and now living in Harlem, said her team’s theme is Afrika, and many of the 500 members of her mas band will wear dashikis, or traditional African tunics. Brooklyn Borough president Eric Adams, judge of Sunday night’s Golden Krust Jamaican patty-eating competition, said he remembers watching from the sidelines as a child and now is happy to march in the parade. Other elected officials, including Gov. Andrew M. Cuomo, was expected to attend. The event has been marred at times by violence. Last year, a 55-year-old man was fatally shot in the early morning hours before the parade. Early Monday, a lawyer who works closely with Gov. Andrew M. Cuomo was shot and wounded at an early morning party and another man was stabbed to death, officials said. Adams, a former police captain, said violence should not “destroy the greatness of the parade” and commended the NYPD’s preparations, including managing the flow of foot traffic. An NYPD spokesman said Sunday special details were assigned to the parade and j’ouvert, the unsanctioned parties at dawn that attracts crowds for dancing and paint-throwing. Garnett Phillip, director of operations at BCakeNY in Prospect Heights, said the bakery has been busy churning out cupcakes topped with national flags of Caribbean countries. About 400 treats representing more than 20 nations were made, she said. Reisha Maynard, 37, of Cambria Heights, Queens, president of Ramajay Mas, a community organization, said 509 costumes were created this year in the mas band’s Nirvana theme. Those marching with Ramajay included both women and men from as far away as Miami representing an array of islands. Some revelers aren’t Caribbean in ethnicity at all, but it doesn’t matter, Maynard said. “We treat everyone like family,” she said.